Taurine is the second-most abundant amino acid found in muscle and aids in cell volumization. Every flavour of NITRO-TECH® won in head-to-head third-party taste tests against leading competitors. Unlike some of the competition, Performance Series products contain superior key ingredients in clinically dosed amounts that are fully disclosed so you know exactly what you are paying for. Burke et al., 2001. International Journal of Sport Nutrition and Exercise Metabolism. 11(3):349-64. 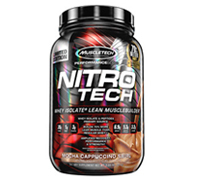 Directions For NITRO-TECH: Mix 1 serving (1 scoop) with 4 to 6 oz. (118-177mL) or mix 2 servings (2 scoops) with 8 to 12 oz. (236-354mL) of cold water or skim milk in a glass or shaker cup. Use between major meals and after exercise. Drink 8 to 10 glasses of water daily. For maximum results, consume 4 scoops of NITRO-TECH® Performance Series daily for a minimum of six weeks. Warnings: Do not use if pregnant or nursing. Consult a medical doctor before starting any diet or exercise program. Discontinue use and consult a medical doctor if you experience unusual symptoms. Do not use if packaging has been tampered with. Store in a cool, dry place.